things to do with your kids Archives | What Should We Do Today? Christmas weekend is here! As always, the holiday events continue this weekend and we head into Winter Break for lots of kids around the city! I will be publishing a list of ideas for winter break within the next few days so be sure to check back! 🙂 Happy Holidays and Merry Christmas! Wildlights – see fantastic light displays, special visitors and performances from 5:00 PM – 9:00 PM each night through January 1, 2018. Gardens Aglow – Gardens Aglow offers special holiday decorations, performances and evening hours at Franklin Park Conservatory. Throughout the season live music and special events are scheduled and the Conservatory is decorated for the holidays. From December 1-31 (except for the 24th and 25th) they are open until 9:00 PM. There will be special family-friendly activities happening all through the season! Christmas Corner at State Auto Insurance – walk through a life-sized nativity following the Christmas story! Choirs are scheduled on Friday and Saturday evenings through December 23rd and free hot chocolate (donations accepted!) will be available on those evenings! Think Outside the Brick – visit the Columbus Museum of Art for a huge LEGO display, special LEGO open build hours on Saturdays and LEGO Holiday decorations! Downtown Lights – visit Columbus Commons and Bicentennial Park for festive light displays! Holiday Parties at Columbus Recreation and Parks – check the link for all the dates for the Holiday Parties at each Columbus Recreation Center! Most of them have passed but a few are happening on Thursday night, Dec. 20th. 10:00 AM – Kids Cupcake Baking and Decorating Camp at Our CupCakery – kids ages 8 and up can learn to measure, mix, bake and decorate cupcakes! There will be winter theme options! Ticket sales end December 21st. 10:00 AM – Winter Break: Mini-Art-Camp! at Art With Anna – kids can make a winter-themed art project to take home! Register in advance. 10:30 AM – Holiday Party! at piccadilly – this holiday party includes crafts, cookie decorating, and more! Captain Captain from the Shazzbots will play at 11:00 AM. 11:00 AM – Drew Murray Magic at Franklin Park Conservatory – a magician performs an interactive magic show at 11:00 AM and 2:00 PM. 4:00 PM – Cookies with Santa! 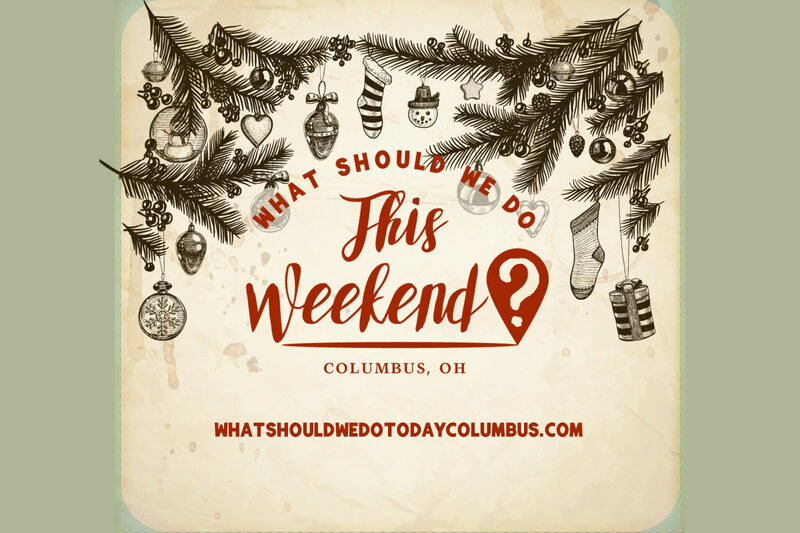 at Coffee Connections of Hilliard, LLC – decorate a cookie and snap your own picture with Santa! Cookies are $1.50 each. 6:00 PM – Christmas Corner Choir Series at Christmas Corner – visit the life-sized nativity and enjoy 3 choirs that will perform beginning at 6:00 PM. 6:00 PM – Holiday Carriage Rides at Easton Town Center – take a carriage ride around Easton Town Center. Cost is $10 per person, children under 15 ride for free with a paying adult. 7:00 PM – Poppy & Branch’s Jingle Jam Skate at Skate Zone 71 – skate to Christmas Music with Poppy and Branch! $8/person includes admission skate rental and glow stick! 9:00 AM – Doll Hair Salon Spectacular at American Girl Columbus – learn new hair styles for your American Girl doll plus take home goodies and enjoy a Fancy Fruit Fondue. Register in advance. See our visit to the Hair Salon Spectacular here. 10:00 AM –Holly Jolly Skate with Santa and Friends at Skate Zone 71 – skate with Santa, Frosty and Rudolph! Free candy cane with each paid admission! Bring your camera! 10:00 AM – Christmas Photos at Indian Mound Mall – picture packages with Santa available until 8:30 PM every day through December 24th. 10:00 AM – Santa Claus at Partners Park – bring your camera to take your picture with Santa at Partners Park! There will also be free coloring and crafts! 11:00 AM – Santa’s Magic Key Storytime at Barnes and Noble – at this holiday story time you can hear a story about Santa and enjoy activities afterwards! 11:00 AM – Muppet Mayhem Band at FP Conservatory – the Muppet Mayhem Band plays your favorite tunes from the Muppets Show. Second show starts at 2:00 PM. 12:00 PM – Central Ohio Model Railroad Club Open House – at this free open house you can check out model train layouts, decorate cookie and more! See 5 on Friday: Holiday Trains for more info! 1:00 PM – Christmas Slime at Pat Catans – make your own Christmas slime at this free event! All supplies provided! 2:00 PM – The Nutcracker at Ohio Theatre – see this festive performance of The Nutcracker at the beautiful Ohio Theatre. Several performances available this weekend. 12:00 PM –The Grinch’s Ugly Christmas Sweater Skate at Skate Zone 71 – wear your ugly sweater to receive $2 off admission to this special skate time! 12:00 PM – Central Ohio Model Railroad Club Open House – at this free open house you can check out model train layouts, decorate cookie and more! 3:00 PM – Christmas Eve Ceremony at Christmas Corner – the Christmas Eve Ceremony includes baby Jesus being placed in the manger. See pictures of the nativity here. 4:00 PM – Frosty & Rudolph Skate Party at Skate Zone 71 – meet Frosty & Rudolph at this holiday skate party! Bring your camera! 4:30 PM – Holiday Classics: A Christmas Story at Gateway Film Center – watch the holiday classic A Christmas Story on December 24th and 25th only at Gateway Film Center.